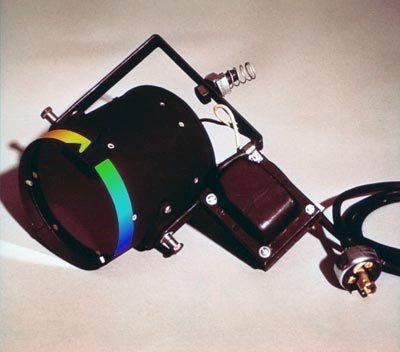 The Adjustable-Color Theater Light produces a range of colors without the need for lighting gels. Each theater light replaces many conventional theater lights, reducing the theater’s costs through the significant reduction of lighting fixtures, and lighting gels. Light from the reflector projects through special polarizing material, producing a wide range of colors. The light’s color is adjusted by rotating the handle to the desired color, manually or remotely with motor control. The effect can be seen in the picture above taken of a transparent cigarette wrapper, photographed through the rotating filter used in the Adjustable-Color Theater Light. Reduction in the number of light fixtures because one theater light can replace many conventional fixtures. Elimination of trial-and-error tests of filter gels in conventional theater lights. Elimination of colored lighting gels. Convenient remote changes of the color can be made during the production.